Amazon CEO Jeff Bezos has unveiled revolutionary plans for a science fiction-like air delivery system that would get customers' packages to them in just half an hour. 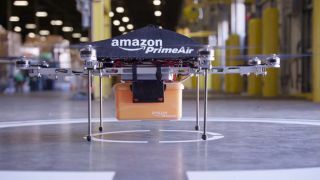 On the U.S. Sunday evening current affairs show 60 Minutes, Bezos introduced Amazon Prime Air, which will utilise unmanned drones called 'octocopers,' to get deliveries from warehouse to destination. According to Bezos, the drones can carry objects of up to 5lbs, which would account for 86 per cent of Amazon deliveries. He also hopes to get the scheme approved and up-and-running within 5 years. These octocopters would operate totally autonomously as they could be loaded with GPS co-ordinates and sent on their way to the home or business, before dropping the package off and flying home. The CEO told host Charlie Rose: "These generations of vehicles, it could be a 10-mile radius from a fulfilment centre. So, in urban areas, you could actually cover very significant portions of the population. "These are electric motors, so this is all electric; it's very green, it's better than driving trucks around. This is…this is all an R&D project." Bezos said the project cannot begin operations until at least 2015, when it receives rules from the Federal Aviation Administration (FAA) in the United States, but soon after the drones could take flight. He added: "I know it can't be before 2015, because that's the earliest we could get the rules from the FAA. My guess is that's, that's probably a little optimistic. But could it be, you know, four, five years? I think so. It will work, and it will happen, and it's gonna be a lot of fun. "The hard part here is putting in all the redundancy, all the reliability, all the systems you need to say, 'Look, this thing can't land on somebody's head while they're walking around their neighborhood'"
So there you have it; a digital camera or a smartphone delivered faster than you could expect a pizza. You can see a video representation of Amazon Prime Air in the quite surreal video below.